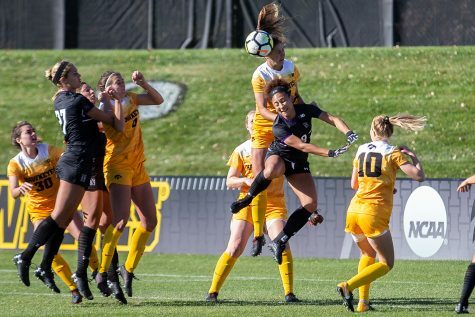 Looking for postseason soccer, Iowa fell in its last road game and in the standings. 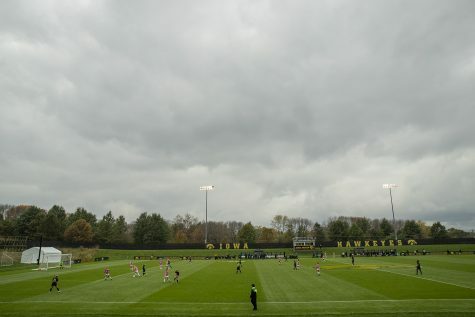 Players fight for a cross during Iowa's game against Michigan at The Hawkeye Soccer Complex on Sunday, October 14, 2018. The Hawkeyes defeated the Wolverines 1-0. 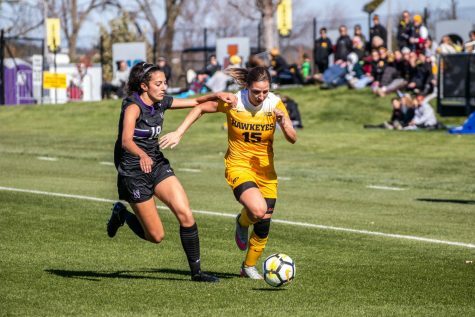 Hawkeye soccer traveled to Minneapolis to take on Minnesota on Thursday night, but Iowa could not overcome the Gophers’ high-powered offense. 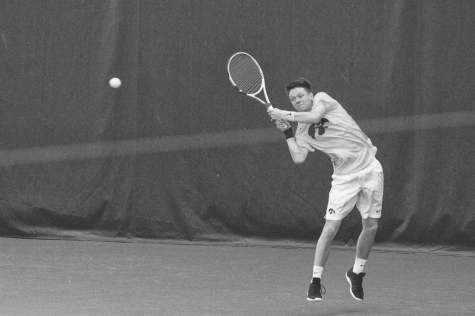 Minnesota took the victory over the Hawkeyes, 3-1. 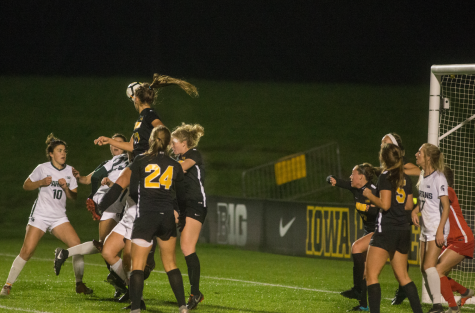 Redshirt junior Kaleigh Haus scored the only goal for the Hawkeyes in the 32nd minute, her 4th on the season. This was a crucial game for the Hawkeyes. Iowa was tied with Minnesota for seventh in the Big Ten; the Big Ten Tournament only takes the top eight teams. This game served as a tiebreaker for both teams. 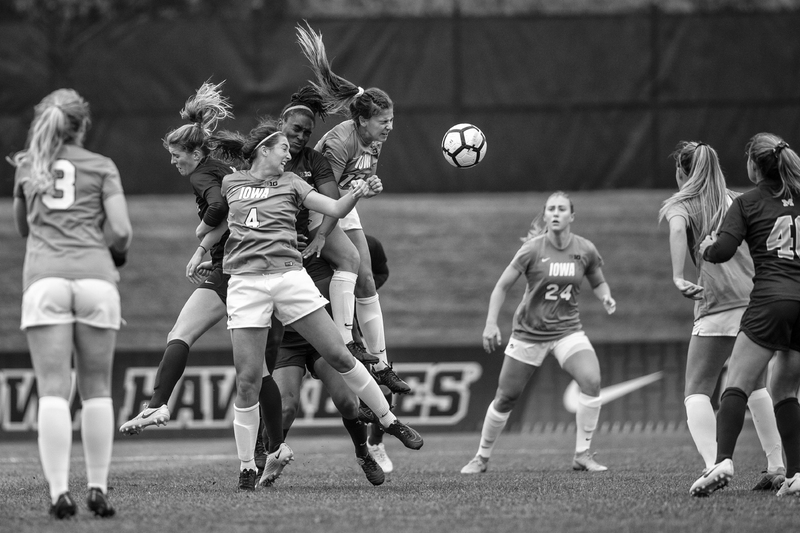 Minnesota dominated on offense and took an early lead in the 13th minute on a corner kick by Molly Fiedler. 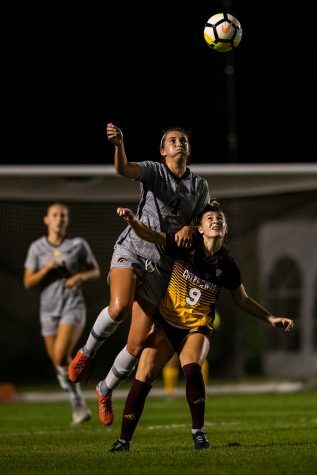 April Bockin quickly added another goal in the 22nd minute for the Gophers. 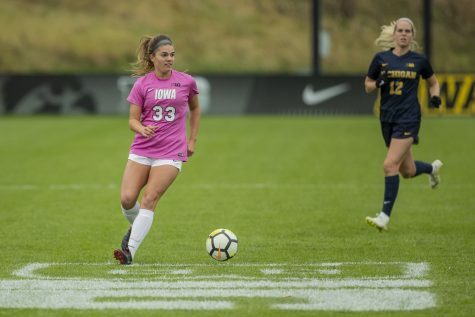 Hawkeye redshirt freshman Josie Durr had the opportunity to equal the score at 2 with five minutes left in the first half, but Minnesota’s defense blocked the shot. 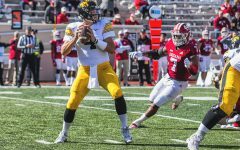 Even after the blocked attempt, the Hawkeyes seemed to have some momentum and a chance to get back in the game going into half. But Bockin sealed the deal for the Gophers. She added the third and final goal of the game on an assist by Nikki Albrecht. Looking at the stats, the Hawkeyes fared pretty well. The offense had 9 shots with 5 of them on goal. Minnesota had 11 shots with 3 of them on goal. The difference in the end was that the 3 shots for Minnesota ended up finding the back of the net. This loss now puts the Hawkeyes at eighth place in the standings with Michigan and Northwestern behind them. 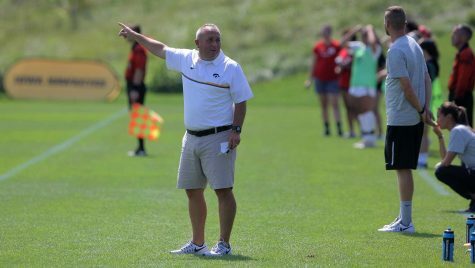 Iowa now has to shift focus and look to return home for Senior Night and the final match of the regular season against Northwestern on Oct. 21 at 1 p.m. at the Iowa Soccer Complex. Coming home to end the season should be good for the team, especially since it has an undefeated home record of 7-0-2. This will be a special game to celebrate the four seniors on the squad and try to secure a spot in the Big Ten Tournament. 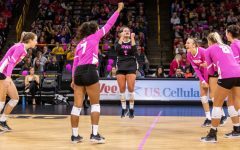 Iowa will send off Jenna Kentgen, Karsen Rauch, Morgan Kemerling, and Rose Ripslinger on Senior Night.